Atlanta, GA (February 25, 2015): Custom Classics™ by David Weekley Homes will soon begin building new homes in The Reserve at Old Atlanta in Suwanee. Zoned to the newly-built Lambert High School, this family-friendly community will feature traditional homes with Old World-inspired exteriors, and will range in size from 3,400 to 4,200 square feet. Buyers in The Reserve at Old Atlanta will be able to choose from seven different floor plans with both upstairs and downstairs owner’s retreats as options. These homes will offer four to six bedrooms, three to six full baths, three-car garages and optional basements. Each of these home’s features Custom Classics by David Weekley Homes’ signature large island and open concept design in the living and entertaining spaces, including the kitchen, dining or breakfast area and family room. 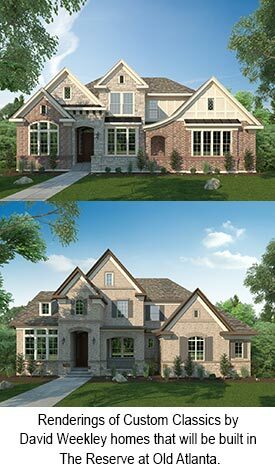 A model home highlighting the best of Weekley’s design features will open in April. Additional options to enhance some floor plans in The Reserve at Old Atlanta consist of adding bedrooms and bathrooms, an outdoor living area, covered or screened porches, game or media room, second owner’s retreat, third-floor walk-up attic storage, sunroom and more. Situated on 105 acres, homebuyers in The Reserve at Old Atlanta will enjoy a private, gated community with a junior Olympic swimming pool, clubhouse, lighted tennis courts, playground, and walking trails. For more information about David Weekley Homes in Atlanta, contact 800-407-9150.